You cannot have missed the news that Sansar has finally opened, though as Beta, for everyone to visit. I must say I have never been too excited and anxious about its coming, but of course I was curious. And last night I finally had the time to download the viewer and hop into this new virtual world everyone is talking about! It is not one world, but more a (growing) collections of worlds called ‘experiences’. It would be unfair to compare it to Second Life, but I tend to do that anyway – as I am so used to navigating through SL and taking pictures without having to think about my keyboard and which keys to use. So in that respect I found Sansar not that easy. The avatars look ..meh…but all that aside: the experiences I have visited so far are really awesome and very photogenic. Yes, I miss the camera controls and there is no option to change the environment settings (no windlight), but for now that’s fine. The graphics are amazing, no blurry textures, no rezzing for minutes, no disappearing mesh in the distance, it all looks flawless. And quiet. I have not met or seen any other avatar, perhaps I was in the wrong places or it is simply not that busy yet. I did not mind, to be honest, it was nice to fiddle around in peace and quiet and finding out how to walk properly. Sitting or other animations, I have not discovered them yet! 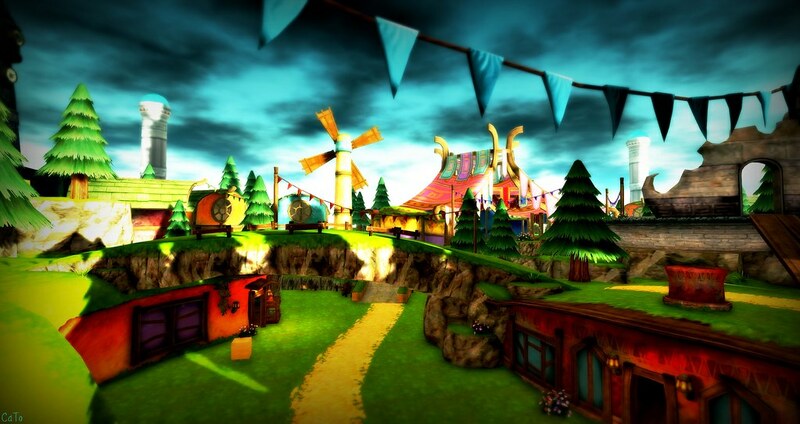 To my delight, yes, it made me smile!, I visited ‘Village of Breeze’ by Kayle Matzerath – a place I have such fond memories of, as it is the recreation of Breeze – Kayle’s sim from the Fantasy Faire 2016! I am sure I will go back, to see what is going on and how experiences are getting better – for now it is a great place to take screenshots and have a different kind of experience, but I was happy to log back in to Second Life, it felt like coming home! Sadly, those of us who use Macintosh OS are unable to view Sansar.